It’s the clearest indication we have ever had yet of an extraterrestrial intelligence–a powerful narrow-bandwidth radio signal that gave every indication of coming from outside the solar system. But is the “Wow!” Signal for real . . . ? Computer printout of the “Wow! Signal”. Are we alone in the universe? It wasn’t until recent decades that science finally had a way to try to answer that question, as the “Search for Extraterrestrial Intelligence” (SETI) began a systematic survey of the night sky, looking for possible radio transmissions from technological civilizations on other solar systems. Contrary to the popular image, SETI researchers are not looking for actual “decoded” messages from the space aliens–what they are searching for is a “narrow bandwidth” signal, a strong radio pulse that is confined to just one frequency, the hallmark of an intelligently-produced artificial signal. While space is full of objects that produce radio waves (there is an entire branch of observational radio astronomy devoted to studying them), these natural signals tend to be spread over a wide range of frequencies–there is no known natural phenomenon that produces a radio signal that is focused within just one frequency. In 1972, the University of Ohio decided to dedicate some spare time with its “Big Ear” radio telescope to SETI, and systematically focused the 150-yard-wide dish on different areas of the sky to search for radio signals. The receiver being used was, as are most SETI searches, concentrated on a 50-channel area around a particular bandwidth, 1420 MHz. This frequency, used by radio astronomers to map the distribution of interstellar gas clouds, is between the natural radio signals produced by interstellar hydrogen and interstellar hydroxyl, which produces a quiet radio spot known as “The Waterhole”. At the time, SETI considered that frequency to be the most suitable spot on the radio spectrum for any intentional signals sent into space to attempt to contact other civilizations. As the computer recorded the incoming radio waves, the strength of the signal was coded by a numerical scale from 0 to 9, then continued upwards with an alphabetical scale from A to Z. For the next five years, the radio search revealed nothing but 0’s and 1’s–empty space and ordinary low-level background radio noise. Then, in August 1977, SETI researcher Jerry Ehman was going through printouts of all the data that had been captured in the past few days when he came across the computer-coded signal “6EQUJ5”, recorded at 10:16 pm on August 15, indicating a rise in signal power that reached a maximum strength of “U” (30 times higher than the background radio noise) before declining, over a total period of 72 seconds, as that particular point in the sky entered and then exited the telescope’s field of view. And the signal was found on only one of the receiver’s 50 channels, a very narrow bandwidth. It was exactly the kind of pattern that would indicate a focused narrow-band artificial signal, and it was right in the Waterhole, the frequency that would likely be used for a contact attempt. Ehman excitedly wrote “Wow!” in the margin of the paper printout. Next, the signal was examined to determine how far away its source was. By international treaty, the area of the radio spectrum around 1420 MHz is protected and is reserved solely for scientific purposes–nobody is allowed to use it for transmissions. Nevertheless, researchers had to consider the possibility that the signal had come from some kind of super-secret spy satellite orbiting the Earth, or by a signal from the Earth that was reflected off an airplane or satellite or even off the moon or an asteroid. Those possibilities were quickly erased, however. The radio signal did not exhibit any Doppler shift (the change in frequency caused by an object that is moving), indicating it was stationary in respect to the Earth. That ruled out most sorts of objects in Earth’s atmosphere or orbit, or any nearby celestrial object (and this was confirmed by the fact that no planet or known asteroid was in the correct position to have reflected a signal). It was, however, consistent with an object at a great astronomical distance, far enough away to be fixed in relation to the Earth–such as a star. At the time of the signal, the Big Ear radio telescope was pointed at a patch of sky about one-fourth the size of the full moon, in the constellation Sagittarius. 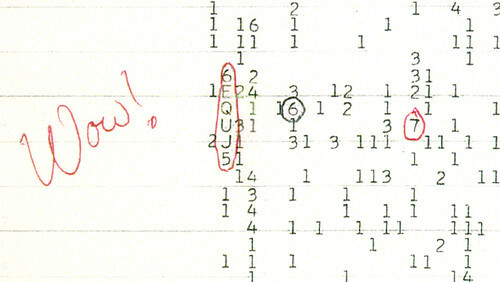 Printouts showed that the signal had not been detected either the day before or the day after, indicating that the “Wow!” Signal had lasted less than 48 hours. In the four decades since then, over 100 different researchers have pointed dozens of radio telescopes at the same patch of sky, and have heard nothing. Whatever the “Wow!” Signal is, it has never repeated itself. (1) A geostationary satellite. These orbit around the Earth at a particular distance that allows them to stay at a fixed point in the sky–they do not move relative to the Earth’s surface, and could have produced a signal without a Doppler effect. However, there were no known satellites in that area of sky, and satellites are forbidden by international convention from broadcasting at the 1420 MHz frequency. And it is enormously unlikely that any satellite would have only broadcast just one signal for one day and never broadcast again. Nevertheless, the possibility remains that the source of the signal was some sort of secret geostationary military satellite, or an Earth signal that was reflected off or re-transmitted from such a satellite. (2) A pulsar or other radio source that sweeps across the sky as it rotates, with a slow rotation. This would explain why the signal has not been detected again–the beacon would only be detectable at the time it passes by Earth. However, known pulsars have rotational periods of just a fraction of a second, and they emit radio signals and static in a wide range of frequencies–they do not transmit narrow-band signals focused at one frequency. Nevertheless, the possibility remains that the signal was generated by some new sort of slowly-rotating pulsar that we have not seen before. Since the source area has been monitored for as long as 14 continuous hours since then without detecting any signal, the rotational period for any such pulsar would have to be longer than that (indeed, since the Big Ear dish did not detect anything for 24 hours before or after the signal, the period between signals must be longer than 48 hours). (3) Another possibility that has not been ruled out is that it was an ordinary low-level radio emission from a hydrogen source in space that “scintillated”—had a temporary increase in power—to produce a short burst of unusual energy, due to some stellar phenomenon or to a coherence effect as it passed through a cloud of interstellar hydrogen gas. This would be an unusual “one-off” event that was unlikely to repeat with any regularity, thereby explaining why the signal was never heard again. The “scintillation” hypothesis seems to be the one held by most astrophysicists. However, there is no detected source of any lower-energy continuous radio signal in the area that could have been temporarily scintillated–if it is there, it would need to be a very low-energy source. (4) An extraterrestrial transmission. Everything about the “Wow!” signal is still consistent with an ET transmission. However, all attempts to hear the signal again have failed, and it is enormously unlikely that any ET civilization would have broadcast just one signal for one day–particularly since a radio signal strong enough to produce the strength observed in the “Wow!” Signal would require a transmitter of at least 2.2 Gigawatts in power, over a thousand times more powerful than anything on Earth. But, others have pointed out, those observers who have looked for the “Wow!” Signal and not found it have been assuming that the signal is omnidirectional; an equally viable possibility is that the alien radio signal is itself a beacon that points in one direction and sweeps across the sky as the alien planet rotates, and therefore can only be detected at the particular time it passes by Earth. The ET Hypothesis cannot be definitively ruled out. So, does the “Wow!” Signal indicate that ET has phoned us? Science simply cannot say. The best we can conclude is that the possibility cannot be ruled out that it was a narrow-band radio signal with an origin outside the solar system–though the source of that signal (and whether the source was natural or artificial) remains completely unknown. Another possibility occurs to me, but I do not remotely have the knowledge to know whether it is at all likely: that the signal was generated by the equipment itself, through some or other hardware or software glitch.